Dynamic glass is clearly taking off. It can now be found in a wide variety of projects in almost every segment of the market including commercial offices, higher education, cultural institutions, and healthcare facilities. According to recent industry research, the transportation sector is also expected to join in this trend because of dynamic glass’ anti-glare properties as well as its ability to tint in accordance with the sun’s rays. 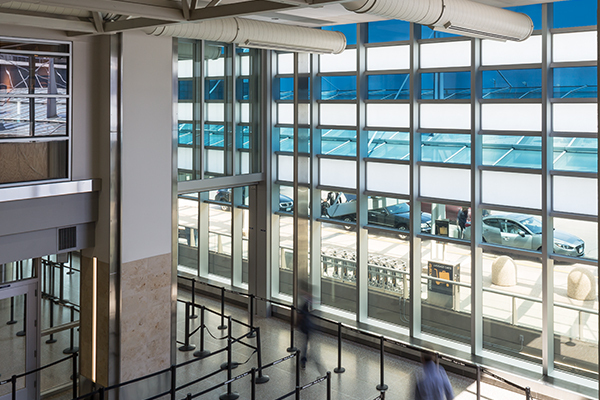 Transportation hubs such as airports, bus stations and other terminals are considering electrochromic glass for its ability to minimize heat build-up and provide a more comfortable occupant experience. At SageGlass, we are also seeing this trend in-action and recently installed 2,800 square feet of SageGlass in Terminal 1-Lindbergh of the Minneapolis-St. Paul International Airport as part of its north security checkpoint project. As many of us already know, airports are stressful, and no one really enjoys waiting in security lines before a trip. Even Bloomberg has “The Airport Frustration Index,” ranking airports across the country based on how long it takes to get to the airport; how easy it is to clear security; the quality of terminals and restrooms; amenities; and how often flights take-off on schedule. While we can’t control the lines, SageGlass helps improve the environment at the Minneapolis-St. Paul International Airport by controlling heat gain and glare to enhance the travel experience. The Minneapolis-St. Paul International Airport, better known as MSP, is an important national transportation hub with more than 400,000 landings and takeoffs occurring each year. MSP served more than 36 million travelers in 2015, making it 16th in North American in terms of the number of passengers served annually. With this many travelers passing through the airport each year, we are glad that our dynamic glass is able to enhance the occupant experience by providing an environment free from harsh glare and heat gain. Anything that helps make the travel experience more comfortable and efficient is good news for all of us. So sit back, relax and enjoy the flight!